The images taken from the films in the mobile works are passages of calm, interludes in the surrounding mayhem. These are moments where clues about time and place might be left with the viewer. 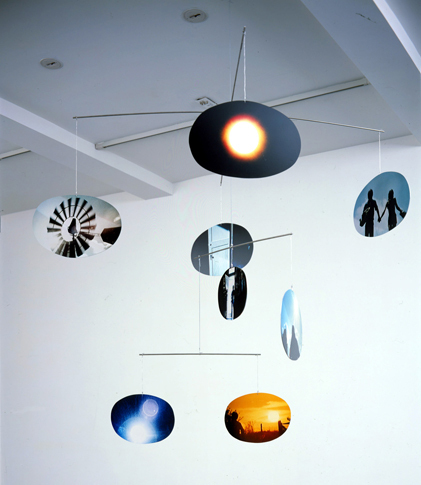 The idea of suspense is taken very literally in the form of the mobiles, hanging from above, released from their narrative. Editing is also an aspect of the mobiles. In effect the pieces are a re-edit of the films, allowing images to float and occupy spaces in a changing relationship to each other, allowing the film to occupy space.